With all of the movies coming out in the past decade about classic comic book superheroes and their adventures, there are finally new superheroes that are stepping into the spotlight. Before, everyone wanted to dress up like that Batguy and Superdude or like the Amazing Spiderman and the Incredible Hulk... and they did, and, sadly, those characters have been way overplayed, like a Top 40's hit song. Now, thankfully, many of the other classic heroes from the comics have been making their long-awaited debuts on the big screen, and kids are learning about plenty more of the characters the comic book universe has to offer. One of these breakthrough heroes is the mighty Black Panther! Now your kiddo can dress up as the king and protector of Wakanda and use these officially licensed Deluxe Black Panther Gloves to complete his costume. 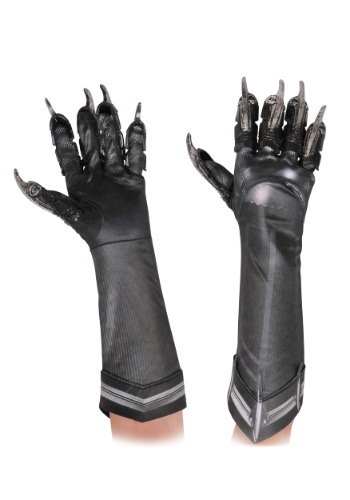 Although his claws won't be retractable like T'Challa's are, we think of it more as an advantage. Sometimes a day being saved is decided upon how a second or two plays out, and why waste those precious seconds getting your vibranium claws out when they can already be ready to go? We think that one day Black Panther will agree with us and make a few alterations to his own battle suit. If your kiddo really dresses to impress, then who knows? Maybe T'Challa will pass the mantle down to your little hero and he will gain all the marvelous powers that come along with being the feared Black Panther!